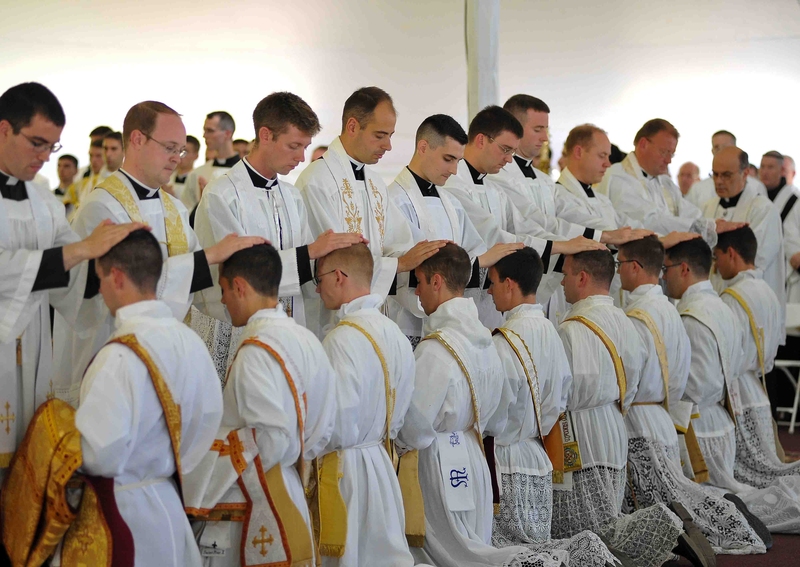 On Saturday, April 12, His Excellency Bishop Bernard Fellay ordained five students of St. Thomas Aquinas Seminary to the subdiaconate. In receiving this, the first of the major orders, these young men bound themselves by an implicit vow to a life of perpetual chastity. Most beloved sons…if you receive this Order, it will no longer be lawful for you to turn back from your purpose, but you will be obliged forever to be in the service of God (to serve Whom is to reign) and with His help to keep your chastity and remain ever engaged in the ministry of the Church. Therefore, while there is time, consider, and, if you are determined to persevere in your holy resolution, step forward in the name of the Lord. By taking a physical step toward the bishop, the ordinands took a spiritual step of immeasurable import. They bound themselves to observe for life this difficult counsel of our Lord, meant only for those specially called to it: “He that can take, let him take it” (Mt. 19:12). They renounced marriage so that they might be able to devote their hearts more perfectly to the service of Jesus Christ and his immaculate bride, the Church. Responding to a divine vocation, they sacrifice the natural goods of wife and family in order to enter more deeply into the mystical marriage between Christ and his Church; henceforth they will participate more intimately in that relationship of divine love, which, as the Apostle St Paul explains (Eph. 5:25-30), is the prototype of which the relationship between husband and wife is but an image. Do you think you may be called by Our Lord, or do you have questions about a vocation?